From Goodreads: A taste of her own medicine. Thoughts: My house is busy. Really busy. In amongst all the time I've been spending with my 13 year old and his transition to high school and his sporting commitments, I found myself feeling guilty over the lack of time my 9 year old was getting. So I made a commitment - we would read together. It's something we both love and guarantees her a minimum of 15 minutes of my time devoted solely to each day. We've decided to work our way through Roald Dahl and this is what we started with. I've never read George's Marvellous Medicine, but it's Roald Dahl, how wrong can you go? Not very I'm pleased to say. A typically deliciously wicked Dahl story. George works hard to concoct a nasty medicine to give grouchy, nasty granny a taste of her own medicine! The side effects are extraordinary and George has to try and recreate it with varying degrees of success. Here's why I think kids (and let's face it, a fair few adults! )love Roald Dahl - he is completely and utterly inappropriate! Who else gets away with writing a story about what is really an attempt to poison your grandmother? Who else could get away with their characters calling each other nasty names or celebrating the demise of their mother-in-law without them being portrayed as horrible people. Kids love it because it is stuff they never could, never would do in their own lives. It's almost a guilty pleasure to read them. I knew when I went looking on Goodreads I would find someone whose review was less than flattering, who does not see Mr Dahl and his wickedness in quite the same light as I do, and I did. For them and their children I feel sorry - everyone deserves a bit of naughty in their lives and Mr Dahl does it brilliantly! 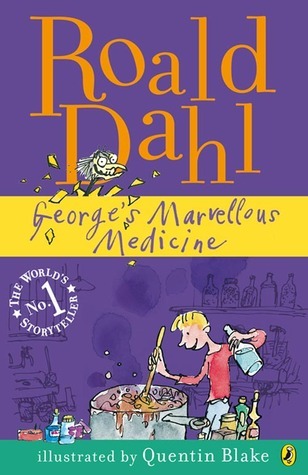 Georges Marvellous Medicine gets 4 stars!